A photo of an empty Starbucks coffee cup which was consumed inside Starbucks. This coffee was purchased using a pre-paid Starbucks card, which only had a balance of .98 cents. 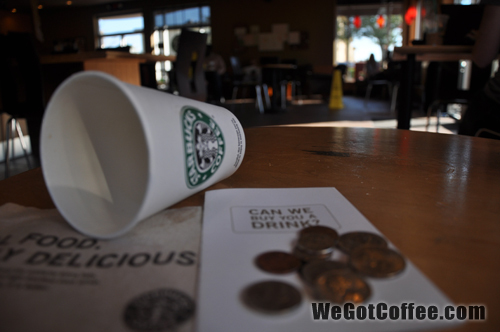 The photo here shows the remaining coins after purchasing the coffee. Starbucks – Can We Buy You a Drink? Not sure what is so appealing about an empty cup of Starbucks. It means time for another coffee!